Dr. Fred Thayer succeeded founding director Dr. Walter McIver in 1976. Dr. Thayer further developed the choir's repertoire and emphasized its touring schedule, eventually leading tours abroad to Spain, Puerto Rico, Argentina, and multiple countries in central Europe. Dr. Thayer retired in 2013 after more than 35 years of service to the Lycoming community. In every life, there is someone who inspires you. Someone who pushes you to the very edge but doesn't let you fall over because they believe in you and know how to achieve the very best possible things from you, in you and with you. Fred helped us to create the music that lives with us, that is always there to remind us of the people, the places, and the events that shaped our lives. Fred shaped my life. He taught me what true commitment was and what it was like to feel so proud of what you accomplished. It was truly an honor to sing in Fred Thayer's choir and I am truly so grateful to him for giving me that opportunity. Choir was made up of so many wonderful individuals, people who devoted their time and talent because they loved the art of making music, but they also loved and respected Fred. Lycoming College is so very fortunate to have Fred Thayer and so are the hundreds of choir members that will walk through the doors of Clarke Chapel and are greeted by someone who will impact them for the rest of their lives. You are simply the best, Fred. Thank you for bringing out the best in all of us. I remember, love, and appreciate Fred Thayer – one of the few "Gentle Giants" I've been blessed to know. 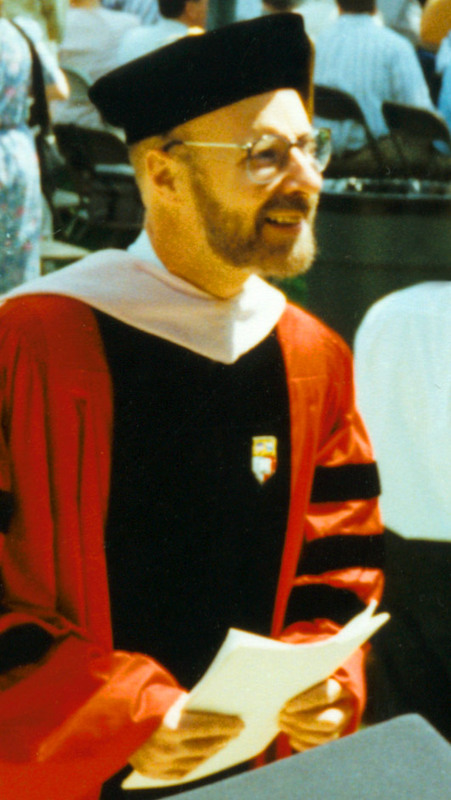 Dr. Fred Thayer in 1996, just before conducting the choir for the 1996 Commencement performance.